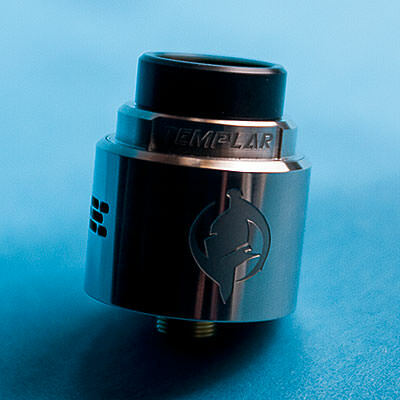 I received this Templar RDA free of charge directly from Augvape for the purpose of this review. Regardless of this, it will not color my opinion on this review in any way, shape or form. This doesn’t come in the usual box we are used to see, instead it comes in a cardboard tube lined with foam that has cut outs for both the RDA that sits on top and also the frosted Bullet top cap and the goodie bag sitting underneath the RDA. In the goodie bag you will find spare o-rings, 510 adapter, a BF pin and a block to put in on one side of the post for use with a single coil. It is a 3-piece RDA and the one I got is the SS version, and the first impression is that it looks really nice and seem to be well built. 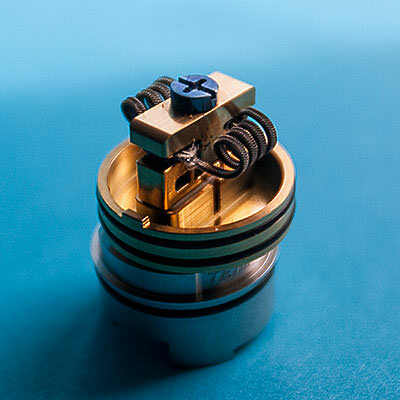 The deck on it is a gold plated velocity inspired clamp system, the post has zirconium dioxide insulators and it got a single titanium post screw to tighten down the legs of the single or dual coil builds you put into it. It is really easy to build on and that single post screw does what it is intended to do and does it well. 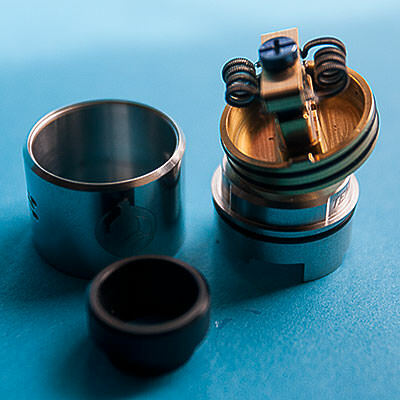 It is an RDA that you can use in single or dual coil mode and it comes with a block that you put in on one of the sides of the post to block off the airflow, making the single coil mode more effective. 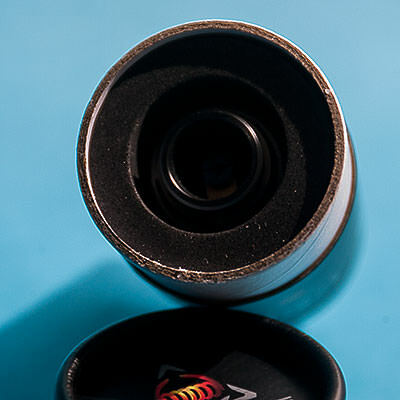 The airflow itself is made out of 6 cyclops styled holes in three rows on each side of the barrel, and the top cap got cut outs on it to adjust the airflow by blocking off one row at the time. The frosted Bullet top cap got two holes on each side that aren’t adjustable in any way. Both caps do have two cut outs that matches the notches on the deck and this is to hold the barrel in place so it doesn’t rotate when you adjust the airflow, and it also help out to put the airflow holes in the same place at all times. As far as I can say it is a bit restricted even fully open so I have been rocking it that way. I can imagine that you single coil users might find it interesting considering it being a bit restricted. The airflow itself is smooth and it doesn’t suffer from being noisy. The juice well is around 7 mm deep and can hold a fair amount of juice and it also got plenty of room for the cotton to reside. As a lot of the new RDA’s we see on the market today this one does also support 810 drip tips, which i’m sure will please all of us that sits on a bunch of nice looking 810 drip tips. 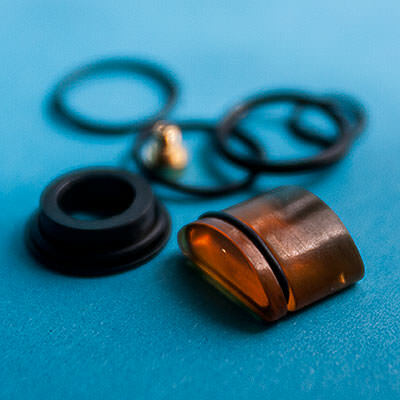 The o-rings does work as intended and I could perhaps wish for them to be a tiny bit stronger but as they are they are not considered to be a con in my book. Since it is a low profile kind of RDA you might have to be careful to not over drip since that will give you the all so well known lava flow into your mouth. I assure you it will give you spit back if you aren’t careful. Looking at how it vapes and what I get from it I can only say that it is a flavorful RDA. I am using one of my own mixes as usual when I test new RDA’s and the flavor I get from the mix is what I do expect and hope to get from every RDA tested. All in all I must say that it has been a nice experience where I have gotten good flavor out of it. 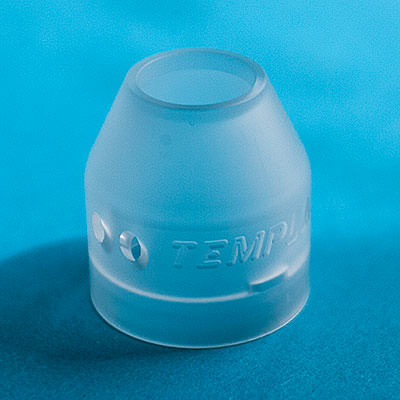 One gripe with this RDA is that the SS top cap and barrel is a bit too thin so it might get really hot when you are using it. Another gripe is, thanks to the low profile of the RDA, that you might get spit back from it if you saturate the cotton to much. This last thing is easily fixed by not over dripping. One more thing that has bothered me is that with the 510 screwed in tight, it isn’t hybrid safe since the 510 pin sits flush with the negative part. It is possible to unscrew the 510 pin somewhat but when I did that I noticed a significant rise in the ohms on the build so I decided to let this one be known as not hybrid safe. I got no issues recommending this RDA to others and I am confident that a lot of people will come to like this when they try it out. Besides that it is priced fair which might make it attractive as well. 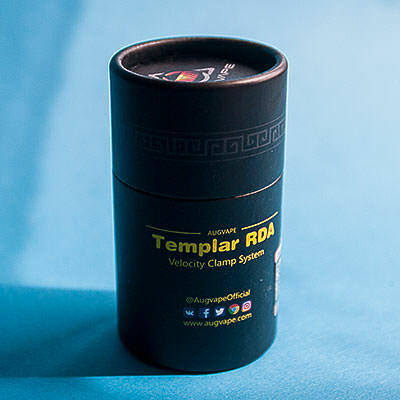 Templar RDA at Augvape for $32.05 at the time I wrote the review. maybe as a single, not a big fan of those clamps. Thanks bro. The clamps does work good though and it is easy to build on. Interesting setup, snd great review of it @Norseman !!! Thank you sir! Great way to start a Saturday morning with an excellent review, a cup of coffee and of course, a good vape! Thanks, on this one you don’t saturate the cotton as much and the spit back goes away. Not as easy to do with an RTA. This is an update to the review on this RDA. Since i posted the review i had a talk with Augvape and they assure me that they have updated the RDA and made the 510 pin longer in order to make it hybrid safe. Just wanted to share this info with those interested in this RDA.